Sift together dry ingredients. Cream shortening, sugar, egg and molasses. Stir in flour. Roll into balls and flatten or roll out with rolling pin and cut with cookie cutters. Decorate with raisins, etc. Bake on slightly greased cookie sheet at 350° for 10 to 15 minutes. 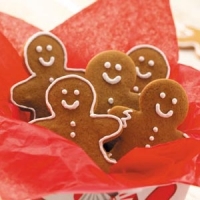 Have fun because gingerbread men are made to be eaten! 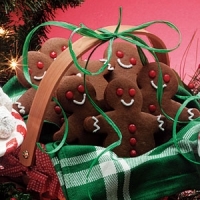 Recipe categories: Desserts, Cookie and brownie, Christmas.